Friday Linx is a recurring feature on our blog. We’re aiming to bring you a collection of links worth a read and cute cat video to ease you into the weekend. This week we did a series of posts diving into how you can best deploy Google Grants for AdWords for your non-profit organization. You’ll also find items on Social Media Week, Facebook, analytics, activism, and training opportunities below. This coming week is Social Media Week around the world. That means you’ll find a lot of free sessions if you happen to live in DC, Miami, New York or San Francisco. If your Klout score isn’t up to snuff then happy party crashing! It’s been widely reported that Facebook Timeline is rolling out for everyone, including pages, very soon. This post has some good advice on how elected officials can approach it, but the same applies for non-profit organizations. There are tons of social media analytics tools out there, some are free and some aren’t. If you are a DIY type then check out these 5 spreadsheets. The Meta-Activism project digs into the 5 functions of technology for activists. Worth a read. NTEN is hosting a webinar on February 14th on effective video practices, $35 for members/$70 for non-members. Previously we posted on TechSoup’s digital storytelling challenge. Their next webinar is on February 16th on post-production. I’ll also be a judge for the contest, get those entries in! 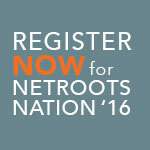 RootsCamp DC is happening February 18-19 and you’ll find a lot of the Netroots Foundation team there this year. Marshall Ganz(!) is teaching an online organizing class starting on February 20th.